Recently a colleague asked me: "How can you deal with users in large Enterprise Tenants, who share the same name? How do you know who is who?" Indeed, this can happen, as soon as your Office 365 Tenant has a lot of users in it. There are some very common names in each language, so you should know who you add to your Microsoft Team. 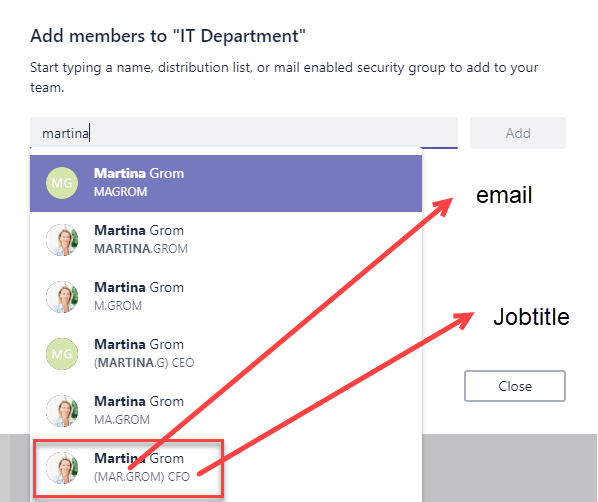 From an organizational perspective, this should be solved with a proper identity management: Users have a unique e-mail address, but it does not end here: there are some other fields that need to be filled, like Job Title, Department and a lot more. But in fact: which fields is the Microsoft Teams user dialog using here? To answer my colleagues question I created some users in my demo environment with the same name. Adding them to a team, it looks like below and is indeed not a very good explanation of who is added now or isn't. Hopefully the Microsoft Teams Team will change that at one point in time. The good thing: when you browse over the name, you'll see the people card and see the users job tiltle and department. As you see in this screenshot, the email-address (without domain if it's an internal user - if its an guest user you will see the domain as well) and the job title are present here so you can distinguish the multiple people with the same name. In that example above, you will probably miss the correct person from finance department, as there are two of them in the same department, but only the job title of the CFO is filled in. love your (Azure) active directory and take care about your user identities. (Pre)Fill in more information about users to have a chance to find the right persons. Use the manager field to build a hierarchy as well. Use Profile pictures as well. 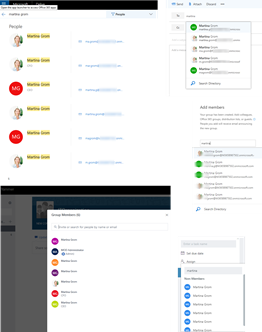 How does this look like in other Office 365 services? This topic with multiple users who share the same name is true in all other Office 365 services as well. 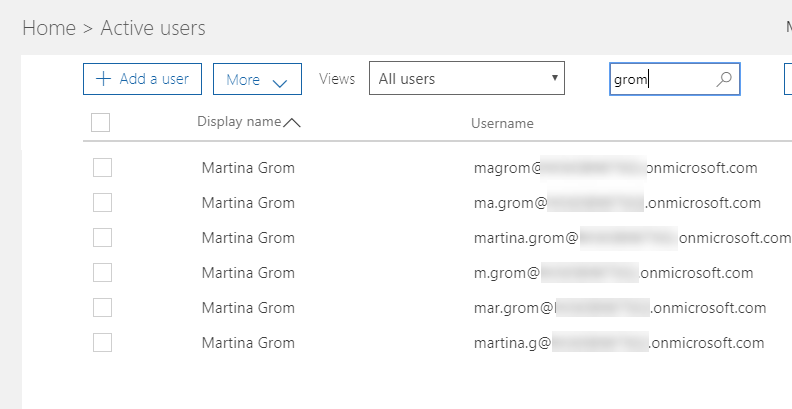 In SharePoint it is literally the same, people search shows you email address and job title. 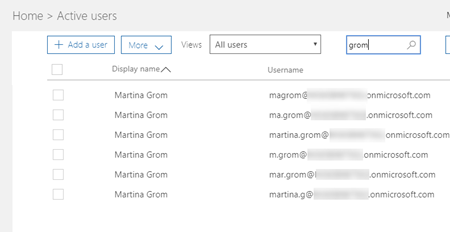 Outlook, Office 365 Groups just show you the email address. Planner shows only the name. 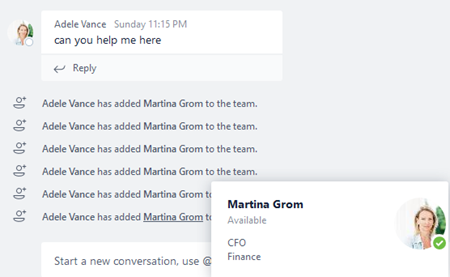 Yammer shows job title and email. So try to keep your directory information up to date! Microsoft team would have world's most intelligent member. https://www.webtechcoupons.com/offers/vmware/]vmware Coupon code are the best way to deducu amount on VMware software purcahsing. I do an incredible degree like your magnificent post. I expected to investigate such sort of article. also, the key occasion when I visit our site. also, I cheerful to be here, a commitment of gratefulness is altogether to share this stunning post. Superb selection of colors! There’s definitely http://www.hotdelhiescort.com/ too much to find out about this topic.